Holiday shoppers were reported to be packing stores Friday morning, ending the best holiday shopping season for retailers since 2007, the AP reported. 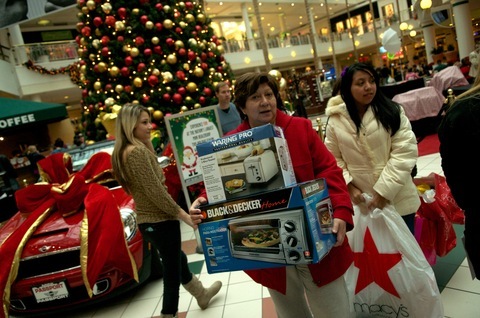 Retailers expect Friday to be a strong shopping day, since Christmas Day falls on a Saturday this year and many workers have Friday off. “I’m calling it Fantastic Friday, because I really do think it’s going to be one of the busiest days of the year,” Marshal Cohen, chief fashion industry analyst with researcher NPD Group, told the AP. Chain-store sales for the week ended Dec. 18 rose 4.2 percent from last year, the Wall Street Journal reported earlier this week. And more people did their shopping from the comfort of home. Online sales rose more than 15 percent this year, to $36.4 billion, according to Bloomberg. For one, the online shopping season started earlier, as retailers began aggressive promotions online as early as the start of November. Online-only sales, plus the availability of certain “Black Friday” discounts online, also helped to drive sales. West Africa’s central bank has blocked Laurent Gbagbo’s access to state funds, further isolating the Ivory Coast president who has refused to concede defeat a month after the country’s disputed elections. The Central Bank of West African States formally recognized Alassane Ouattara as the winner of the election and have handed control of the state’s accounts to him, saying only members of the country’s “legitimate government” will have access to the funds. The U.N. General Assembly has also recognized Ouattara as the winner of the election. Ouattara remains in a hotel, surrounded by military forces that supports Gbagbo, Bloomberg News reported. Violence has killed at least 173 people in the Ivory Coast since the disputed election last month, according to the U.N..
At least 11 Pakistani soldiers were killed Friday when about 150 militants launched coordinated attacks on five military checkpoints in Northwest Pakistan, along the Afghanistan border. Twenty-four militants were also killed. The attacks were the largest since Pakistani forces began operations in the area, the New York Times reported.